I have to say that I like receiving blogging awards! It provides a little break from writing about traveling (not that I actually need one). But this is a fun award and I’ll give it a try… I was nominated for this award by Cloud of Lace, a lovely new blog that I have enjoyed following. It covers topics like food and fashion, so be sure to have a look for yourself! 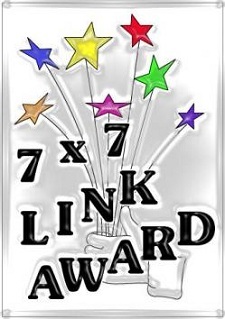 For the 7×7 Link Award, the recipient must provide links to their own posts within the following 7 categories and then pass the award on to 7 bloggers. If you have received this award or don’t care to pass it on, that’s fine. I just wanted to recognize your blogs anyway! This entry was posted in Travel and tagged 7 x 7 Link Award. Bookmark the permalink. CONGRATULATIONS on your 7X7 Link Award. I enjoy reading your blog and I am honored and thankful that you have listed my blog and nominated me to also recieve this award. I hope to follow up on the guidelines listed in the next few days. Thanks Francine! And congratulations to you, too. I hope you enjoy the award! Oh, and I’m sorry, in my shock I forgot to add my congratulations to you on receiving the award in the first place. Congratulations, very well deserved! I love the idea of the list of seven articles, I’m going to do the same thing on my blog, thank you. Thanks so much. And it’s a bit of a challenge picking the stories for the categories! I was thinking it might be! You’re welcome. I really enjoy your blog – it makes me want to visit all the tearooms that you write about! Thanks Meg- more fun! I’ve been to zumba this morning and was actually sitting in the garden (shock! horror!) in my very sheltered pergola for the first time this year. Yippee! The sun’s moved round too far now so I’ve come in to receiving this- brilliant. Be nice to check out some of the other blogs- that’s the good bit. I’ve just been re-organising mine and adding pages so at least I can remember what’s in there. Congrats to you too. Yours is a lovely blog. Well I am thrilled as I can be. I so love your blog and all your fab travel stories and photos. I am honored to be chosen by you and 7 X 7 will be my next blog! Thanks so much again and for stopping by to read my little blog. Hi Meg, congratulations on receiving the 7 x 7 Award, and many thanks for nominating me as well. You are right, it is really fun to be on the receiving end of these awards, even when they make you think a lot. I’ll get on with my assignment ASAP. Hi Marcia! Thanks for the kind words. And congratulations to you, too, for your fine blog! What an honor (congrats) and a new twist to blogging awards! I’m still trying to to figure out how to link outside of my own blog. It’s an honor to get a blogging award, and thanks! You must think I’m terrible that I haven’t done anything regarding your nomination of my blog for this award. I just wanted you to know that I do really appreciate it and haven’t forgotten. Right now I am dealing with my son who just had a tonsillectomy, but I will get to it eventually, I promise. Thanks again.